With all the songs with the word “home” during this season, i.e. Home for the Holidays, Celebrate Me Home, I’ll be Home for Christmas,etc., it is no wonder that our clients feel a bit left out and resentful about their circumstances right about now. Although we have been helping our clients apply for housing there are just too few low-income vacancies and too many people who need housing. However, we are infusing our resource center with a bit of Holiday hope! Our team is looking for donors who will help our program assure that the neediest clients have a happy holiday. Clients will submit a “wish” list and donors are matched to individual clients. Gifts range from financial aid for housing to hats and winter coats. I personally am also excited about our Holiday cooking party. We will invite our clients to get together and cook a fabulous Holiday meal in Mary Elizabeth Inn’s Kitchen this month. This will give us time to celebrate with our clients and rejoice in the true spirit of the season: togetherness, comfort and joy which are also the true meanings of home. On Thursday night, November 18th, VeraMax House held its first Guest Bartending Fundraiser at Tonic, a small lounge with the welcoming atmosphere of “Cheers” on Polk Street in San Francisco. Board Member Heather Volante, Executive Director Joyce August, and Case Manager Hailey Pobanz all guest bartended from 6 to 9 pm to raise money for VeraMax House. All tips and any donations made at the door went directly to fund VeraMax House services. Happy Hour started slow, but by 8 o’clock the bar was busy and so were the guest bartenders. Everyone had a good time behind the bar, friends and colleagues enjoyed a few cocktails and watching Joyce learn how to mix cocktails. Everyone was a good sport and the event was enjoyed by all. The guest bartenders raised $246 in tips, which was donated directly to VeraMax House. VeraMax House looks forward to doing more fundraisers in this fashion and hopes to get more people involved in the future. Thanks to all who contributed before and after, to our Board members and their friends, as well as Tonic’s great staff. A big thank you to all who attended, we couldn’t have done it without you! On April 19th, we held our first major fundraiser and raised over $25,000! We had over 80 people participants at the event, which was held at the Jewish Community Center – SF. We started off the evening with a wine and cheese reception featuring wines donated by Cuvaison, Blackstone and Robert Mondovi vineyards (thank you to them!). The participants then heard Alicia No’oy and myself talk about the mission of VeraMax and how we’re delivering our services and making a difference in the lives of our clients. The highlight of the evening was hearing from Marshall Goldsmith, the acclaimed business guru, executive coach and bestselling author. Marshall talked about his new book, MOJO, and all of the participants seemed to get a lot out of and enjoy what he had to say. Thank you, Marshall, for graciously offering to be our keynote at this event. We finished off the night with more wine and cheese and much networking among the participants. Thank you to all of our participants and donors for making the fundraiser a big success. We got a good head start on the funding we will need to raise this year to make a difference in these women’s lives. It is a happy day at VeraMax. We were able to help another client of ours find housing!! Considering the immense amount of work we do to help our clients successfully find properties and navigate the application process, fighting through various road blocks along the way, we are always to thrilled and relieved when our clients are placed. This woman, like many clients we have, had a home where she lived independently for many years in San Francisco. She was very concerned she would soon become homeless because she was at risk of eviction, through no fault of her own, and her social security income was far to low to find new housing. This is a common story for many of our clients and they come in feeling helpless, frustrated and saddened that they have to reach out for help. Fortunately, she was accepted into the Mary Elizabeth Inn, which is a Single Room Occupancy Residence for women and a significant partner of VeraMax House. She will have her own room but will share a bathroom and kitchen. This is permanent housing, so she can stay there indefinitely or she can continue to work with us to eventually find an apartment through subsidized senior housing in the Bay Area. The rush has mellowed a bit and I have a stable and full caseload. Now with some time to take a short breath, I can focus my energies on helping my clients find stability in their lives. For some this means permanent housing, for others it means consistent weekly counseling. Counseling can help clients in so many ways. Some use it to untangle the web of their lives to find out where, how and why they have been self-sabotaging their success or stability. Others dig into past personal relationships to understand and heal the pain of the past so that they may heal themselves, repair relationships, or begin to connect to others again. Quite often, however, the two are married in that I meet the client for case management and within that session issues or emotions come up that need addressing. The fact that these can be addressed then and there in a therapeutic way is what sets us apart from many other agencies. We help our clients in a holistic way and are there with them for the long haul. We understand that the problems and challenges they face do not have easy answers and cannot be addressed appropriately with a quick fix or a band-aid approach. Our goal is to end the cycle of homelessness by striving for a true understanding of each individual and their lives so that we can help them rise above the daily survival to find peace, solace and sanctuary. The VeraMax House for Older Homeless Women is holding its first major fundraiser on April 19th, 2010 with Dr. Marshall Goldsmith. Dr. Goldsmith is “One of the fifteen most influential business thinkers in the world” [London Times & Forbes] and the author of the bestselling book MOJO: How to Get It, How to Keep It, and How to Get It Back When You Lose It! 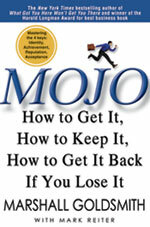 MOJO was rated as the #2 best seller on the USAToday – Money list and the #3 best seller on the Wall Street Journal – Business list. Dr. Goldsmith’s interactive developmental seminar will be held from 5pm to 8pm at the Jewish Community Center – San Francisco. To donate and register for the event, go to www.regonline.com/veramax.